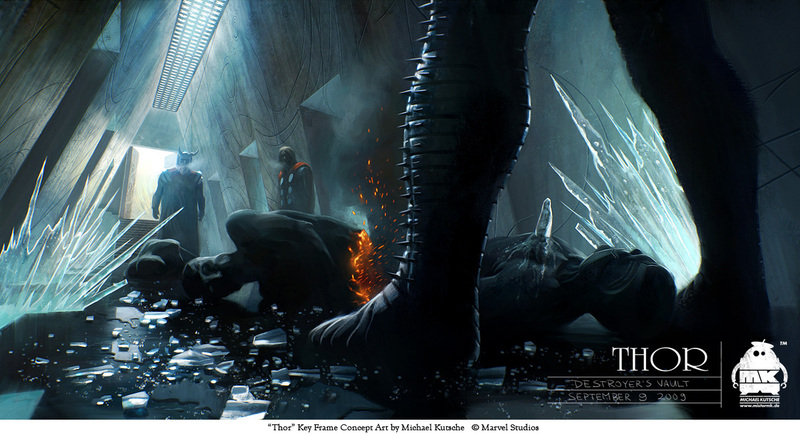 Original concept art for "Thor", directed by Kenneth Branagh. This is one of the key frames I did, showing Thor and Odin while they discover what's left of the Frost Giants who attempted to steal the Casket of Ancient Winters. Great choice on the colour palette and I love the perspective and layout of the frame. This was one of my favourite scenes in the film when we get our first glimpse of the destroyer. There are lots of little touches in there that are outstanding. For example, the "smoke" coming from their silhouettes to show how cold it was in the room. The angle is awesome too. man, great work on the thor stuff!